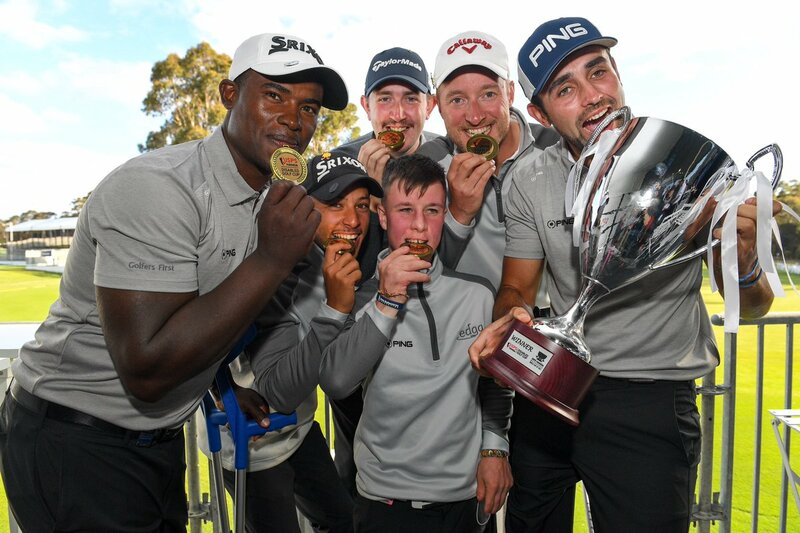 Dundalk Golf Club’s Brendan Lawlor is on top of the world after helping the World Team beat Australia in the first ever ISPS Handa Disabled Golf Cup in Melbourne. Played alongside the World Cup of Golf, the two day event was a further opportunity, after last week’s Australian All Abilities Championship in Sydney, for 12 of the world’s top disabled golfers to show their skills off to a wider audience in an intensely competitive environment. Lawlor, who finished second in last week’s event, teamed up with Spain’s Juan Postigo in Friday’s foursomes and Saturday’s fourballs, to deliver two emphatic wins and two vital points as they led the World team from the front to a 3.5 to 2.5 victory over Australia. The 21-year-old admitted the past two weeks has been amazing for both himself and disabled golf. “The second place finish in Sydney gave me amazing exposure over here and I definitely saw that when we moved to Melbourne. The cameras were always on us and the crowds were in awe in what we were doing as we were playing the same course as the professionals. “It was a great honour to be the first disabled golfers to lift the trophy. It was even better for it to be presented to us by Peter Phillips who is a fantastic ISPS Handa ambassador and a great guy,” said Lawlor. Such was the impact Lawlor has had since arriving in Australia that when he arrived at Melbourne’s Metropolitan Golf Club, Ireland’s World Cup team of Shane Lowry and Paul Dunne sought him out and invited him to join them for a practice round. “Shane and Paul are two gents. They approached me and said hello first. They knew who I was and it felt amazing. Playing golf with them was even better,” recalled Lawlor. Lawlor and Postigo were handed the honour of leading the World team out in Friday’s foursomes and it didn’t take them long to put the first point on the board as they proved too strong for Mike Rolls and Tony Coates in what were extremely tough conditions. They won 6&4 and helped the World team lead Australia 2-1 after the opening day with Lawlor happy with how they had played. “It felt pretty good,” Lawlor said. “We were pretty slow to start but we hit a lot of good shots and from seven to 12 we played pretty steady. On Saturday they were again sent out first as The World team looked for the 1.5 points they needed to take the trophy. Lawlor and Postigo again showed the way by finishing the job on the 14th as they romped to a 5&4 victory over Australia’s Cameron Pollard and Tony Coates. They were a remarkable three-under-par when the match ended but Lawlor admitted it took them a while to get control of the match. “The weather today was really nice. It was windy but it was warm. I got off to a slow start today even though I had a great par on the first. The next few holes I went stale but Juan played really solid when I wasn’t playing well. We were one over after eight and I then hit this three wood to 60 feet on nine and holed it for eagle was an amazing moment and a big moment in the game. We stayed steady and were three under for the 14 holes we played which was solid shooting. Lawlor had his father on his bag with him for the two tournaments in Australia and admitted it was special to be able to share those great moments with him. Lawlor’s big objectives include trying to form an Irish Disabled Golfers Association and helping to promote golf’s case for inclusion in the 2024 Paralympics. He believes that the past two weeks have helped both objectives take a big step forward. Lawlor now heads back to Ireland and will finally have an opportunity to take stock on what has been an unbelievable year for him. 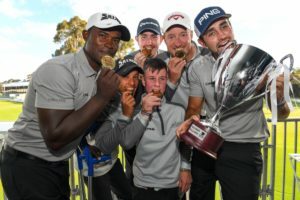 As well as his Australian exploits it included wins on the European Disabled Golfers Tour in France and Czech Republic and saw him move to third in the World Rankings. He also mixed it with able-bodied golfers at the highest level and was part of Dundalk’s senior panel which won the Leinster Barton Shield and reached the semi-finals of Leinster Senior Cup. Lawlor won both his matches in the Senior qualifiers of the Senior Cup at Laytown & Bettystown and also succeeded in getting his playing handicap down to one.